20NiCrMo2-2/1.6523 is a low nickel,chromium-molybdenum alloy steel which is close to 1.5810 steel. 20NiCrMo2-2 steel has half of the Nickel content and added a small amount of Molybdenum element. 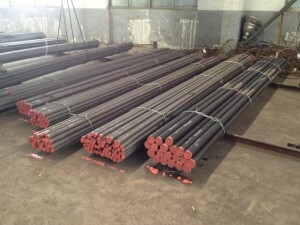 DIN 1.6523 steel also improves the content of Manganese,so it has better hardenability and strength than 18NiCr5-4. DIN 1.6523/20NiCrMo2-2 is suitable for parts which require a good toughness and wear resistance. 20NiCrMo2-2/1.6523 Alloy steel manufacturers and suppliers, supplied in round rods,square/flat bars,rollers,shafts,blocks and forging pieces.